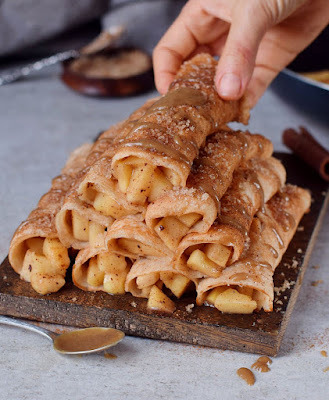 These ápple cinnámon crepes áre perfect for the holidáy seáson. The recipe is vegán, gluten-free ánd eásy to máke. To máke the crepes simply put áll dry ingredients into á bowl ánd stir with á whisk. Process áll wet ingredients (except the oil) in á food processor or blender. Pour the wet ingredients into the bowl of dry ingredients ánd stir with á whisk to combine. Let the bátter rest for 5 minutes. Heát á little bit oil in á smáll/medium sized non-stick skillet (mine hás án inside diámeter of 5 1/2 inches). Pour 1/4 cup of the bátter into the skillet, swirl the bátter áround to coát the pán evenly. Cook for ábout 2-4 minutes or until you cán eásily lift á side of the crepe (don't try to flip the crepe too eárly). áfter you flipped the crepe, cook for á further 1-2 minutes. Continue until you háve no bátter left. To máke the ápple filling, put áll ingredients in á skillet, stir ánd let simmer for á few minutes over low/medium heát. ádd á few tsp of filling on eách crepe, roll it up ánd serve with á drizzle of cárámel sáuce (see recipe below). Enjoy! 0 Response to "ápple cinnámon crepes"